Little is known of the life of Camillo Agrippa. As the title page of his Treatise on the Science of Arms indicates, Agrippa identified himself as Milanese. He was an engineer by profession, and thus called upon to supervise a variety of public and private projects. According to his own account, he arrived in Rome on the 26th of October 1535. There he became part of the team assembled to move the famous Heliopolis Obelisk from the Circus Gai et Neronis, where it had been placed by Caligula in 36 C.E., to where it stands today in front of St. Peter’s basilica. His collaborators in the project were the architect Antonio Sangallo the Younger and Michelangelo Buonarroti, both of whom had worked on the Palazzo Farnese in Rome. Like Michelangelo and Sangallo, Agrippa was also associated with the literary and intellectual circles around the powerful Alessandro Farnese. Agrippa published his Treatise on the Science of Arms in Rome in 1553 with the papal printer Antonio Blado. In the intervening years he worked in and around Rome, performing such wonders as the waterworks for the gardens of the Palazzo Medici. 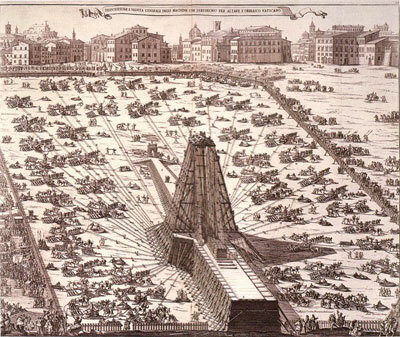 Three years after Agrippa presented Gregory XIII with his Trattato di trasportar la guglia in su la piazza di S. Pietro (Treatise on transporting the obelisk integrally to St. Peter’s) in 1583, the task of moving the immense block of stone was accomplished by Domenico Fontana. Agrippa died c. 1595 and was inscribed with the Congregation of the Virtuosi in the Pantheon.